You won’t find too many clients who can afford to install full-scale theme parks in their residential backyards, but that’s exactly what builder Steven Knight ran into on this project. 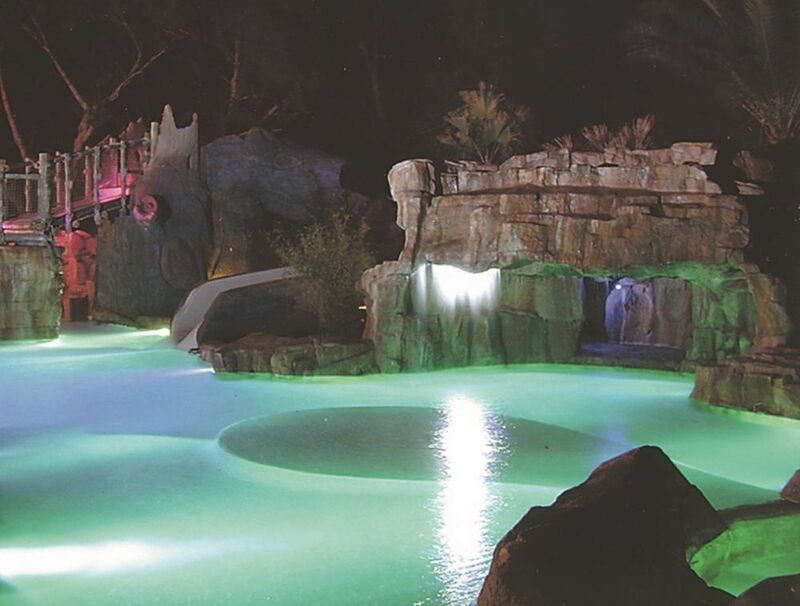 Indeed, this owner had the imagination (and the budget) to bring a host of childhood fantasies to life over his sprawling estate in Central Florida, and now the watershapes at Foxtrotter Ranch are a true monument to kids young and old. I like a good challenge in my work, and I like to have fun making it happen. This project embodied the best of both experiences. The project displayed on these pages was built for a wealthy client who lives on a working horse ranch in the rolling green countryside near Ocala, Fla. Our company, Certified Construction, was up to the task. We build hundreds of highly customized watershapes each year for a variety of theme parks, resorts and high-end residences. Most have highly developed “themes,” so we’re accustomed to providing our clients with heavy doses of imagination and creativity. The basic marching orders on this job were straightforward: The owner wanted a theme park on his property for his kids – and he didn’t really care about the cost. Fun was the name of the game, and imagination was the currency that got us in the front door. The result is a series of watershapes that combine various elements found in theme parks and resort hotels – but rarely seen in residential projects. We’ve worked on bigger projects with bigger budgets, but at $1.6 million and counting, this is by far the largest private-residence project I’ve ever seen. To quote the client here, the design needed to have “snap, crackle, pop.” Let’s take a tour of Foxtrotter Ranch and see what it takes to perform at that level of expectation. The original project called for two primary pool areas, one for kids and one for bigger kids (including the adult variety). The client wanted slides, grottos, interactive water, beach entries, waterfalls, fog machines, lighting, rock structures, rainmakers and bridges, all built with as much creative detail as we could muster. He told us he wanted us to “blow his mind,” so that’s what we tried to do. Right away, we decided to go with a “Swiss Family Robinson” theme, filling and surrounding the water with structures that suggested life in a jungle treehouse. The kiddie pool and its various interactive toys start with a 360-degree beach entry. About 50 feet across, the pool gradually slopes to a maximum depth of 18 inches. 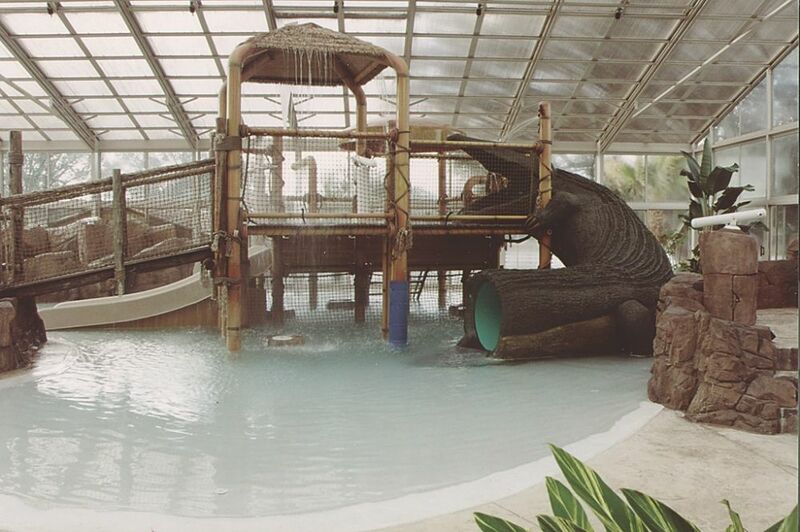 In the center is a massive treehouse and a handcrafted, 18-foot alligator slide. The whole affair is set beneath a 60-by-60-foot Plexiglass and aluminum enclosure with a retractable roof: When the sun shines, 16 massive panels slide back to allow the Florida sun to drench the area; when it’s cold, the panels shut out the elements so the kids can still enjoy indoor play. 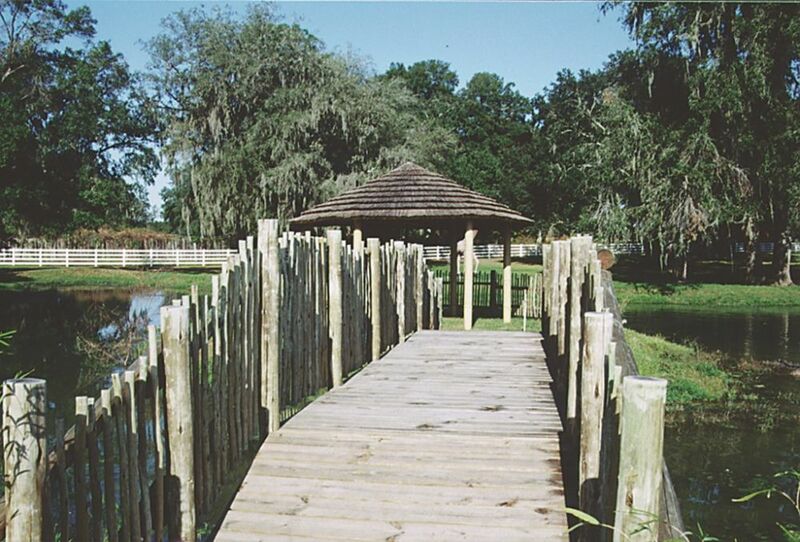 The central play structure was built in conjunction with ComPac Filtration of Jacksonville, Fla. They designed and assembled the basic aluminum sub-structure and plumbing within the treehouse and were also instrumental in designing the equipment pad. The structure itself looks like a bamboo hut with adjoining bridges. The uprights are seamed aluminum with a faux-bamboo finish on the outside. The walkways use eucalyptus wood planks that hold up beautifully to water with no protective finish at all. The overhead roofing is the real thing, too, made entirely of bamboo thatch material. The entire structure is an interactive toy from end to end, beginning with the roof and rainmaker waterfeatures supplied by Polaris of San Marcos, Calif. Water literally pops up everywhere, spraying, squirting and spewing from a variety of nozzles and weirs on the bamboo uprights themselves. 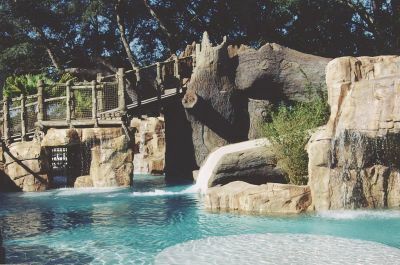 There are also faux-bamboo water cannons along with a mushroom-style sheeting waterfeature mounted on the treehouse platform, a tire swing rope and totem poles that spit streams of water – not to mention the alligator waterslide, hand-sculpted by project manager and chief designer Roger Nauman. In all, the kiddie pool contains 23,000 gallons of water and circulates at about 2,000 gallons per minute – a feature designed in such a way that it could easily meet the demands placed on the sanitizing system by dozens of children playing at the same time. Indeed, the plumbing is all done to Florida commercial standards. Among other things, that means that all returns are gravity fed: There is no powered suction on the drains, thus preventing even the remote chance of suction-related injury. The outside pool, a large free-form vessel, contains about 60,000 gallons of water also circulated at the brisk rate of 2,000 gpm. It ranges from zero to nine feet in depth and is finished in gleaming white Hydrazzo supplied by Aquavations of Coral Gables, Fla. The outdoor pool has an even more impressive tree house at its heart, with a bigger slide and waterfeatures, caves and adventures designed to appeal to the older kids and adults. The tree slide is a full 60 feet in length and dumps bathers into the deep end of the pool. It features a prefabricated fiberglass trough surrounded by a hand-sculpted, hand-finished tree trunk. In designing the treehouse and slide, Nauman configured the fallen trunk to have the profile of a horse’s head. It’s a huge creative detail – but barely noticeable until someone points it out. The rock structures outside are all meant to suggest a southwest/Arizona feel – all very rugged and masculine. 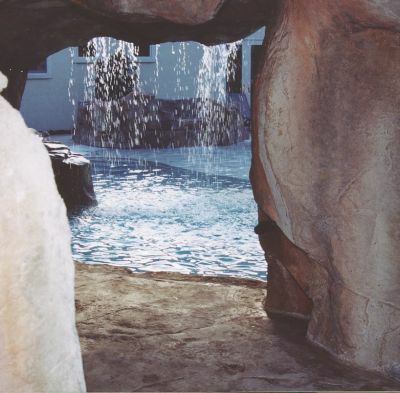 The grotto (located beneath the bridge) provides an interesting point of entry into the pool: When walking from the kiddie pool toward the outside pool, you come to a set of steps that leads down into the water and through a tunnel in the rock structure. Inside this area, we created a spooky, haunted-cave effect with a fog machine and soft, fiberoptic lighting supplied by Fiberstars of Fremont, Calif. We also added some spa jets to give the water the turbulent appearance of a witch’s cauldron. Quite creepy. This tunnel opens just outside the the kiddie-area enclosure and leads visitors to the outdoor pool complex. With fiberoptics, a fogger and bubbling cauldrons along the way, this passage provides a dramatic transition between the two areas and adds its own sense of adventure and fun to the overall experience. There’s also a second major rock structure on the far end of the pool near a beach/sunning area. A cave extends beneath the structure and includes a bench area positioned beneath another rainmaker fixture. The top of the structure contains planters for landscaping. Another rock waterfall is located adjacent to the elevated pathway leading to the top of the slide – a fine example of Nauman working to add visual interest and detail to the overall design. The outside area is enhanced by a seven-foot spa positioned adjacent to the shallow end of the pool. Dozens of fiberoptic lighting fixtures are installed in and out of the pool, and the whole area looks absolutely amazing at night. As we were working through the initial planning of the two swimming pools, the client decided to take us for ride around his 135-acre property. Not far from the pool area was a wooden structure that served as a station for a half-scale diesel railroad, just like the kind you see at amusement parks. A beautiful faux-steam engine and two canopy cars ran along the 1.5 mile loop. 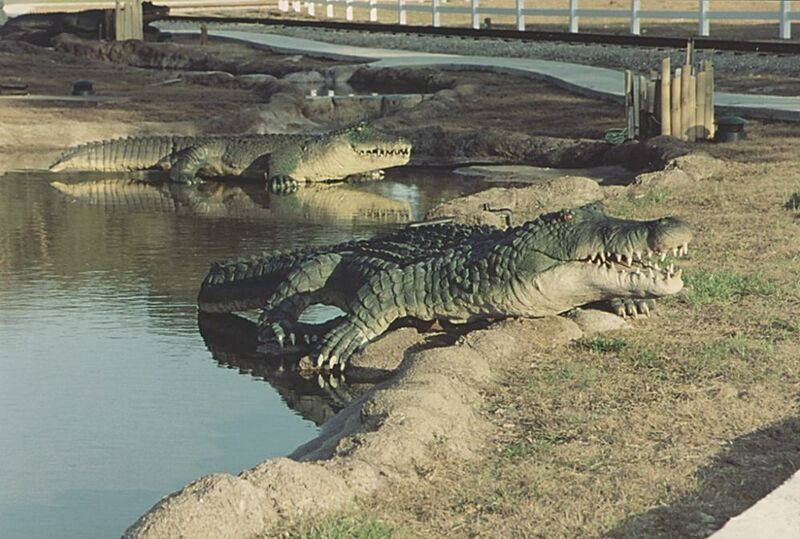 The themed areas include a rock structure that serves as a hideout for two animatronic bandits who hold up the train; an African lake complete with alligators, elephants, giraffes, monkey and hippos; a Florida river complete with a panther, alligators and a beaver dam; and, finally, a massive faux-rock sandbox area where children can dig for fossils. In all, the train ride has 20 moving figures and another 20 static ones. The animatronics system was designed by Nauman and manufacturered by KX International of Apopka, Fla. The figures are run mostly by pneumatic power supplied from a central compressor station located near the center of the railroad loop. The compressor provides air pressure to substations located in each themed area, and a series of electrical relays and switches operate the various moving parts in each figure. 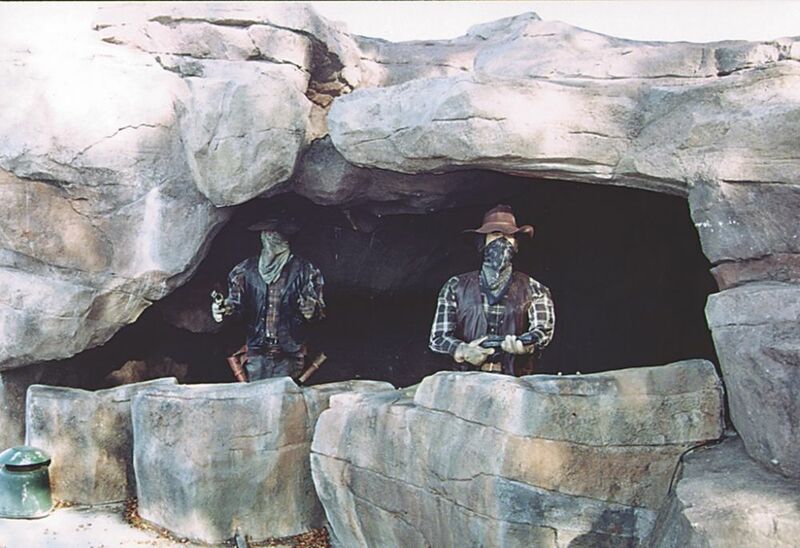 The first stop on the ride is the bandit hideout, where two highly detailed figures rise from beneath a rock face to hold up the train. A synchronized soundtrack with music and voice-over narration plays through overhead speakers on the train. The most ambitious of the four areas is the African lake, the second stop on the approximately half-hour tour. There we built a 5,000-square-foot lake that includes a 20-foot central island reached from the shore via a wooden bridge. 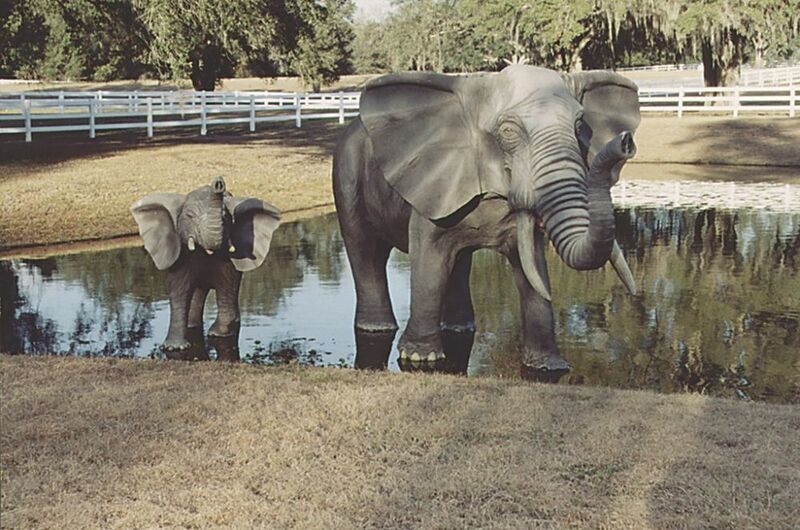 An African-style hut serves as a shady destination on the island, from which you get the best views of the animatronic elephants and alligators. 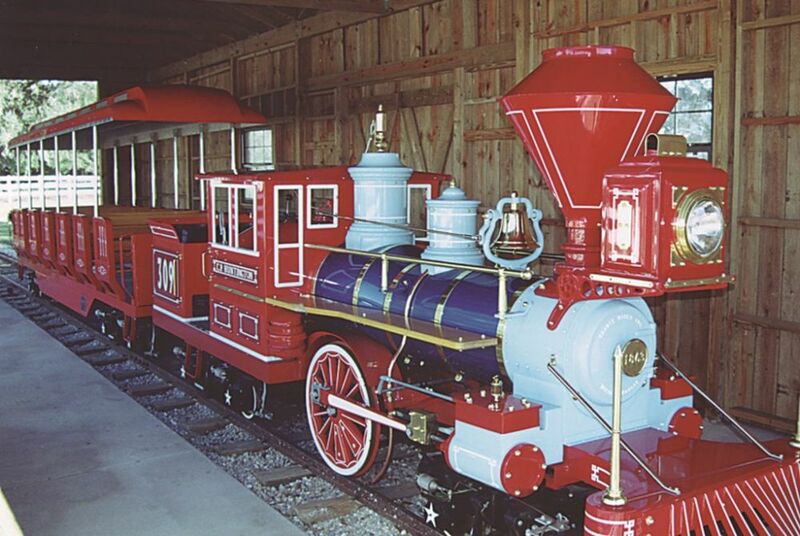 A brightly colored train carries family and guests to four themed areas scattered along a 1-1/2-mile loop around the property. Riders are accosted by bandits, visit an African lake, spend some time in a Florida swamp and have a chance to play Indiana Jones while digging for fossils. This combination of creativity, imagination and showmanship is what our watershaping work is all about. Next comes the Florida-themed location, starting with a concrete path along a faux-rock stream that passes a beaver dam – and a 12-foot alligator triggered by an optical sensor. As you walk by, the ’gator surges toward you, opening its mouth and baring its teeth. 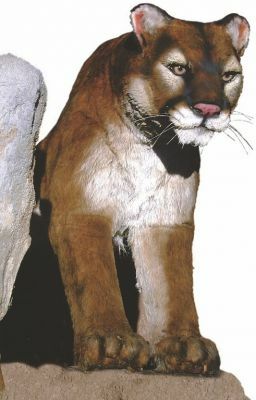 There’s also a cave that houses an authentic looking Florida panther. The stream itself stretches a full 200 feet in length. We do things a different way at Certified Construction. We have more than 100 employees, all of them dedicated to extending the envelope of creativity and excitement when it comes to watershapes for resorts and theme parks. We build elaborate projects all over the world and have grown every year in both the number and size of projects we tackle. The keys to success? We believe they are creativity and the willingness to take chances. With that in mind, we devote tremendous resources to design and development and are always looking to incorporate new technologies into the mix. Often that means seeking expertise outside the company and working in cooperative and strategic alliances to solve technical problems and provide new features for our clients. The project described in the accompanying article is an example of what can happen when you bring a full palette of creative options to the client – and are able to sell the sizzle. There’s a great deal of showmanship and imagination that goes into our work; at the core is a basic understanding that all of the technical sophistication in the world isn’t worth much if you can’t appreciate the joy that can come from it! At this writing, our work at Foxtrotter Ranch is ongoing. At some point in the not-too-distant future, we’ll wrap up our work with landscaping, lighting and a formal waterfeature to show off a beautiful stallion sculpture at the entrance to the property. The area adjacent to the train station already features a merry-go-round and a faux rock wall for climbing; before we’re through, we’ll also be installing a row of “teepee-style” overnight lodgings for guests lucky enough to be invited for sleepovers at the ranch. We’re not certain when we’ll be packing up and leaving the jobsite for good: It seems that every time we think we’re getting close, the owner comes up with another set of new ideas. Even with that small bit of uncertainty, this project so far has been a pure delight. It makes us keep thinking how great it would be if every one of our clients had and sustained this uncluttered, child-like focus on fun: It’s infectious, and it brings out the kid in everybody who visits the ranch. Steven Knight is president of Certified Pool Mechanics/Certified Enviroscapes, a watershape design and construction firm based in Bonita Springs, Fla. A 23-year veteran of the swimming pool industry, he began his career in 1977 in Fort Myers, Fla., where he specialized in residential pools. 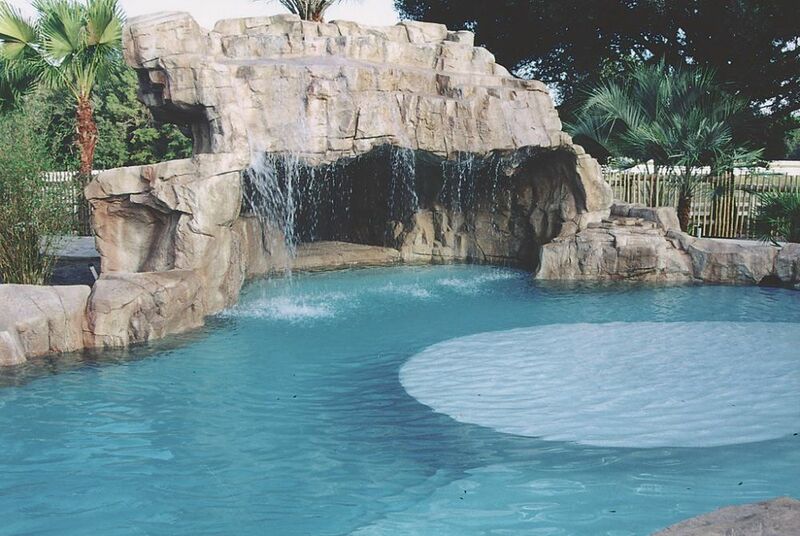 In 1992, he acquired Certified Pool Mechanics, a maintenance firm, and immediately expanded the company’s operations to encompass design and construction. Moving further into commercial and institutional work, Knight founded the company’s Certified Enviroscapes division in 1996 to focus on highly specialized, themed designs and construction for amusement parks, museums and public aquariums.